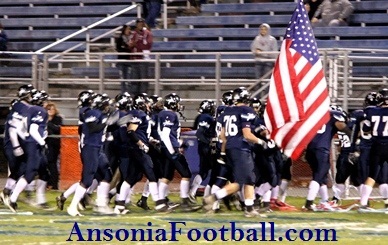 Ansonia Football | Home of the Chargers - 20-time State Champions! State Qtr. Finals: Ansonia 49, Rocky Hill 27! The Chargers are headed back to the class S state championship game after their win over Rocky Hill Saturday! Arkeel Newsome ran 36 times for 269 yards, and scored 5 touchdowns for Ansonia. Jai'Quan McKnight also threw 2 TD's passes, one a beautiful 71 yard bomb to Witold Gul, and the other a 15 yarder to Tom Majchrzak. The Ansonia defense also caused a few big turnovers, included a great interception by Tyler O'Connell. Ansonia will be looking for their 3rd straight State Championship next Friday vs. old foe the Woodland Hawks 7:00 PM at Arute Stadium! The Chargers, playing without their starting quarterback Jai'Quan McKnight (ankle) turned the keys to the offense over to Senior Arkeel Newsome to run the WIldcat Offense. All Arkeel did with the opportunity was to run the ball 26 times, gaining 492 yards, and scored 7 touchdowns in the Chargers 49-21 win. 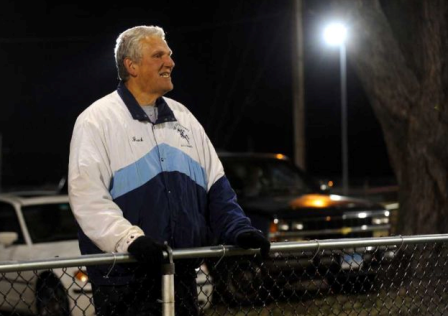 In doing so, he became the fist player Connecticut High School Football history gain over 10,000 yards in his career. Newsome found the endzone 7 times for the second straight game, and also managed over 400 yards in two straight games as well. The Chargers moved to 12-0 on the season, beating Naugatuck 66-28 on Thanksgiving morning. They won their 40th straight game, and now lead the overall series with Naugatuck 69-35-11 in a rivalry that dates back to 1900. Senior Arkeel Newsome, playing in his final regular season game, had a day to rememeber. He carried the ball 40 times, gaining 406 yards, and scored 7 rushing touchdowns. Junior QB Jai'Quan McKnight also scored for big blue. The Ansonia Chargers won their third straight NVL Championship Wednesday night, beating Woodland 48-7. Senior Arkeel Newsome ran 21 times for 222 yards, and scored on TD runs of 24, 28, 7, and 50 yards. He also scored on 29 yard pass from Jai'Quan McKnight. Sophomores Tajik Bagley (scored on a 62 yard run), and Tyler Bailey (scored on 37 yard pass from McKnight) added TD's for the Chargers (11-0). The Charger defense played a strong game, limiting Woodland Tanner Kingsley to 10-29 passing, no touchdowns, and intercepted him 3 times. The Chargers will play the Woodland Hawks for the NVL Championship on Wednesday, November 20 at 6:30pm at Municipal Stadium in Waterbury. Come out and cheer for Big Blue! Ansonia improved to 10-0 on the season with the 50-8 win Thursday night. Jai'Quan McKnight threw for two TD's, one to Tyler Bailey (28 yds), and another to Thomas Majchrzak (38 yds) to get the Chargers started. Arkeel Newsome also ran for three scores (10, 40,16 yards), and Senior Jack Williams added two touchdowns on a 2-yard, and a 1 yard run, and Tyler Bailey scored his 2nd TD of the game on a 7 yard run. The defense held the Bulldogs scoreless through halftime, and allowed a rushing TD mid-way through the 3rd quarter. The Chargers won their 37th straight game Thursday night, setting the school record for consecutive wins with a 21-20 win at Seymour. The Chargers trailed the scrappy Wildcats at halftime, 14-7. Arkeel Newsome scored on a 14 yard run in the 3rd quarter to cut the deficit to 14-13. Then he scored again early in the 4th quarter to give the Chargers the lead. After successful 2 point conversion pass fro McKnight to Bagley, the Chargers led 21-14. The Ansonia Chargers continued their winning ways, running their record to 8-0 on the season with the win on Thursday. They have also matched the school record for consecutive wins at 36 (set back in the 1975-78 seasons). Arkeel Newsome carried just 3 times in this one, for 103 yards and scored three touchdowns. One on a 7 yard run, another on an 84 yard run, and a third on a 78 yard punt return. Jai'Quan McKnight got things started early for the Chargers, returning the opening kick off 85 yards for a touchdown. The Chargers ran their record to 7-0 with a 62-27 victory over Wolcott on Friday night. Arkeel Newsome tied his own state record (shared with others as well) by rushing for over 300 yards in his third consecutive game. Newsome ran 34 times for 327 yards, and 4 touchdowns on runs of 9, 16, 51, and 15 yards, an also scored on a 78 yard punt return. Jai'Quan McKnight ran for two score, and also threw a 36 yard TD to Witold Gul in the win. Siaheed Sanders also scored for the Chargers. Next game: Friday, November 1st vs. Watertown at Jarvis Stadium. Newsome becomes the CT State all-time Rushing leader! Heading into the 2nd half of play against Masuk, Arkeel Newsome needed 43 yards to eclipse former Charger Alex Thomas' state record for rushing yards in a career. On the first play of the 3rd quarter against Masuk, McKnight handed the ball to Newsome. Newsome went left, then broke right - and clear down the sideline for a 57 yard touchdown -and a new State Record! For his career, Newsome now has 8,385 yards! Congratulations on yet another Record!! Ansonia and Derby renewed their rivalry in week 5. Both the Chargers and the Raiders entered the game undefeated at 4-0. The first half was a close match, with Ansonia leading 20-14 at halftime. However, in the 2nd half, the Chargers pulled away with 22 3rd qtr points. Arkeel Newsome rushed 33 times for 315 yards and 5 touchdowns. Newsome scored on runs of 76, 5, 48, 14, and 21 yards. Jr. QB Jai'Quan McKnight rushed 94 yards and 3 touchdowns, on runs of 1, 46, and 7 yards. Sophomore Tajik Bagley added a 7 yard TD run as well. The Chargers improved to 4-0 on the season with a 47-14 win over Wilby at home on Friday night. Arkeel Newsome carried the ball 17 times for 212 yards and scored four touchdowns on runs of 45, 17, 3, and 26 yards. Quarterback Jai;Quan McKnight scored on a 39 yard run, and also threw a 30 yard touchdown to Thomas Majchrzak, while Saiheed Sanders added a 15 yard touchdown run as well. The Chargers led 27-0 at halftime, and 40-0 in the 3rd qtr..
Next up: at Derby Friday night, October 11th at 7:00pm. Both teams come into the game 4-0. Come out to Derby and support Big Blue! Week 3: Ansonia 62, Holy Cross 13. The Chargers improved to 3-0 on the season, defeating the Crusaders 62-13 behind Arkeel Newsome (4 TD's) and Tajik Bagley (4 TD's) last night in Waterbury. Newsome continued his amazing season, rushing 11 times for 309 yards, and 3 TD's. He scored on runs of 70 yards, 58 yards, and 59 yards. He also scored on a 38 yard pass from McKnight. Bagley scored on a 70 yard pass from McKnight, and also on runs of 23, 4, and 53 yards. Senior RB Hugh Jackson also scored on a 3 yard run. The Chargers ran their current unbeaten streak to 30 games last night, as Arkeel Newsome carried nine times for 165 yards and four touchdowns (and had two TD's called back due to penalties). He scored on runs of 10, 55, 29, and 25 yds. The Ansonia Chargers beat the Torrington Red Raiders 52-7 in the season opener for both teams on Friday night. Senior Arkeel Newsome led the way, rushing 10 times for 183 yards and three touchdowns - all in the first quarter. In all, the Chargers had three players rush for over 100 yards during the game. SophomoresTajik Bagley (12 carries, 118 yards and 2 touchdowns), and Tyler Bailey (15 carries, 132 yards, and a touchdown). Sophomore WIlliam Phipps and Senior Saiheed Sanders also scored for the Chargers. 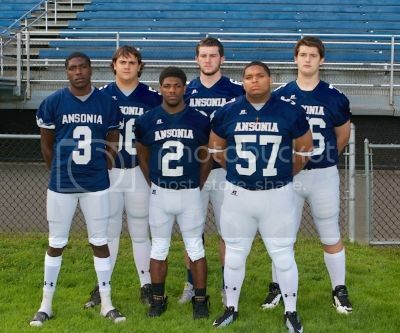 The 2013 Ansonia Chargers Captains have been named. The 2013 football schedule has been released, including pre-season scrimmages. Home games are shown in bold. Joseph Edward Potter, 49, passed away Friday, Aug. 26, 2011. He was the dearest son of Sophie Potter and the late Laurence E. Potter. A graduate of Ansonia High School, Joe went on to Brown University where he excelled as quarterback on the football team, and graduated with a degree in economics. He went on to receive a master's degree in business administration from the University of California-Los Angeles. After a long career in finance in California and New York City, Joe returned to Fairfield University where he earned a degree in education. Several members of the 2011 Class M Championship Team were selected to the New Haven Register All-State Team. Congratulations to the following players. A total of five members of the football team were All-State/Class M selections by the Connecticut High School Coaches Association. The Ansonia Chargers won their 17th State Title! The Chargers defeated the Ledyard Colonels, 38-0, at Rentschler Field in East Hartford. The #1-seeded Chargers topped the #4 seed Berlin Redcoats, 48-14, in a dominating performance at Sheehan High School in Wallingford. Ansonia was led by sophomore RB Arkeel Newsome, who rushed for six touchdowns in the contest. 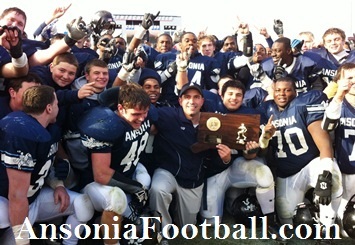 Ansonia wins the Class M Quarterfinal at Jarvis Stadium in dominating fashion, 35-6. Arkeel Newsome rushed for three touchdowns. Elliot Chudwick threw a 10-yard TD pass to Jake LaRovera and Tyler Lester rushed for a 10-yard touchdown. The Chargers will face Berlin (10-1) on Saturday, December 3rd at 2 p.m. at Sheehan High School in Wallingford. 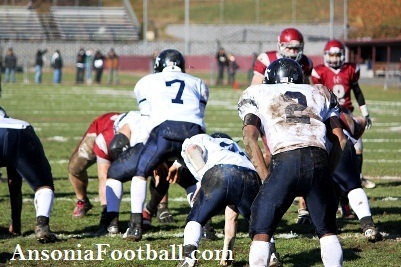 Ansonia improved to 11-0 with a win over Naugatuck on Thanksgiving morning at Naugatuck HS. The Chargers are the 2011 Naugatuck Valley League Champions! Ansonia jumped to a 14-0 first-half lead over Holy Cross (8-2, 6-0) en-route to a 33-0 victory over the Crusaders. The Chargers were led by Arkeel Newsome on offense, who rushed for five touchdowns, and Tyler Wood on defense, who had many tackles-for-loss and a fumble recovery. Elliot Chudwick went 4-5 for 64 yards passing while Newsome carried the ball 36 times for 293 yards on the ground. The Chargers are now 9-0 overall, 6-0 in the NVL Brass, with a 51-22 win over the Wilby Wildcats. Ansonia led 32-0 after one quarter of play. Sophomore RB Arkeel Newsome had five touchdowns for Ansonia (3 rushing: 56, 7, 14 yards; 1 receiving: 35 yards; 1 punt return: 69 yards). 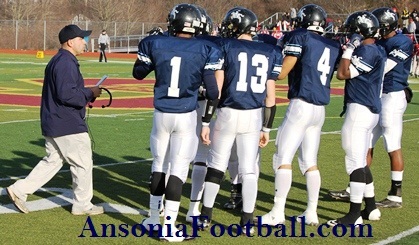 Ansonia captured the 2011 NVL Brass Division title with a 48-14 win over the Wolcott Eagles at Joe Monroe Field on November 4th. The Chargers were once again led by sophomore RB Arkeel Newsome. Newsome ran for five touchdowns and tossed a touchdown to junior WR Andrew Matos. Jai'Quan McKnight also scored on a touchdown run for the Chargers.